Some petal bells have a number marked on them. Most other styles of sleigh bells are not so marked. The number marking is a measurement of the bell's diameter; it is not directly related to the sound of the bell. 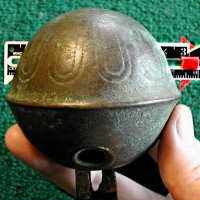 Although some people only collect bells that are size marked, there is no real difference in the worth, quality or rarity of marked bells compared with unmarked ones. Most petal bells marked with a size were made in the mid 1800s or later, although a few early-1800s bells also have size markings. The term "No" is sometimes seen with the size marking. This is an abbreviation for the word "Number". ANTIQUE bells 2 1/2" or less : Round UP to the nearest 1/8 inch. ANTIQUE bells over 2 1/2": Round UP to the nearest 1/4 inch. All NEW bells: Round UP to the nearest 1/8 inch. Check the table below to determine the size of your bell. This method will work for most bells, but do not be too surprised to find bells marked with sizes that do not follow the "rules" presented here. Bell makers, like dress makers, were sometimes generous and other times stingy in their sizing. One guy's #12 bell might be another's size #10 or #11.